REAL SAGA (AUS) (Bay 2006-Stud 2009). 4 wins at 2, STC Todman S., Gr.2. Sire of 341 rnrs, 197 wnrs, inc. SW Candelara (ATC Adrian Knox S., Gr.3), Real Surreal, Sylpheed, Real Good, Sagaronne, Secret Saga, SP Sagatona, Stroak, Epic Saga, Kirabo, Easy Drama, Choose a Saga and of Coastal Prince, Real Princess, Realing, Powerful Saga, Saga Miss, Saga of the Storm, A Day to Remember, No Problem, Outback Saga, Hot Saga, Real Mean, You Did What, etc. All Girls Rock (f. by Captain Sonador). Winner at 2 in Aust. Sowhat Imarockstar (f. by Real Saga). See below. CHOISTAR (Choisir). 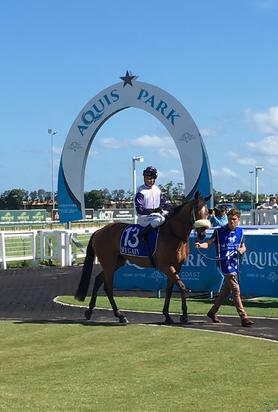 2 wins at 2, A$158,800, AJC Fernhill H., L, 2d BTC Doomben Slipper, L, QTC Dutton Park Rowing Club 2YO H., 3d BRC Vo Rogue P., Gr.3, Norths Devils Leagues Club Gold Edition P., 4th QTC TJ Smith Classic, Gr.1. Sire. Smooth Groove (Fasliyev). 4 wins at 1000m, 1100m, 2d VRC Talindert S., L, MRC Berwick & District Journal 2YO P., 3d MRC Broadbridge H., MVRC Northland Shopping Centre H., SAJC Sam Kekovich at Chairman's Luncheon H.
She's a Rock Star. 6 wins. See above. Spearmint. 3 wins from 1000m to 1950m, 3d MVRC City of Moonee Valley H.
Melanya. Winner at 1200m, 3d BRC Councillors 2YO Cup. Fascinating. Winner at 1600m in Aust. Velvet Rock. Placed in Aust. Halos Image. 5 wins-1 at 2-at 1200m, 1400m, 3d ATC Australian Turf Club H.
Pipers Point. 11 wins to 1400m, A$101,490 in Aust. Mosshappen. Winner at 1100m in Aust. Halo Deer. Winner at 1200m in Aust. Open Book (Shamardal). 4 wins to 1400m, A$211,855, ATC More Than Ready at Vinery H., Tab.com.au H., 2d ATC Ming Dynasty H., Gr.3, 3d ATC Roman Consul S., Gr.2, Tooheys New Evening Star H., Cal Rei H.
Time for Three. 3 wins to 1400m to 2017-18 in Aust. Carrie Ann. 2 wins at 1100m, 1400m to 2018-19 in Aust. Sveldte. 12 wins. See above. Rabble. 2 wins at 1200m, 1400m, 3d AJC Laurent Perrier Champagne H. Producer. Disastrous. 3 wins to 1400m, BTC Air New Zealand H., 3d BTC Energy Smart Performance H.
FREE FACT (Known Fact). 2 wins at 1¼m, 1½m, Haydock Summer S., L, Newmarket Running Gap S., 2d Newmarket Main Reef S. Sire. Freestone. 3 wins from 1¾m to 2½m, York Lamson Chemical S., Racall Timeform Connection H.
Free Mover. 2 wins at 11¾f, 1¾m, Sandown Jennifer's Diary H., 2d Newmarket Multiyork Comfort H., 3d Newmarket Girdlestone Pumps H.
Freesia. Winner at 1½m, Newbury Newtown S. Producer. DANZANTE (Arzak). 7 wins from 1300m to 1900m in Venezuela, La Rinconada Copa Sweet Candy, L, Clasico Asociacion Hipica de Propietarios, L.
FLYING DREAM (Most Welcome). Third top filly on The 1993 German 2YO Free H. 4 wins-2 at 2-from 1400m to 3200m, £295,101 in Germany, Hoppegarten Europachampionat, Gr.3, 2d Mülheim Preis der Diana, Gr.2, Hannover Preis der Hannoverschen Sparkassen, Gr.3-twice, 3d Baden-Baden Oleander Rennen, Gr.3. Producer. Race Record: 11 Starts 0-2-2 A$23,800. Placed at 2 & 3 to 2018-19, 3d GCTC Pink Ribbon Cup 2YO P.